(with a serious soft spot for dad jokes). Andy joined the KPS3 crew in 2018—bringing with him more than 12 years of impressive industry experience. 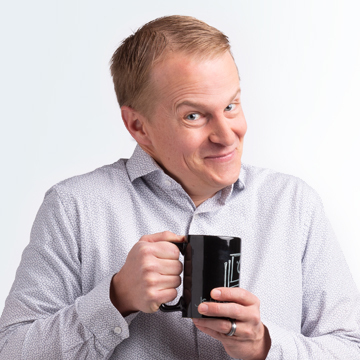 As our VP of Client Strategy, Andy recommends comprehensive, research-based strategies to ensure clients effectively engage their audiences and exceed their marketing goals while they’re at it. Andy earned his B.A. in journalism from the University of Nevada in 2004 and his M.S. in information management from the University of Washington in 2007. Upon graduation, Andy worked as an account manager for One To One Global (previously Twelve Horses) where he had a hand in everything from the global email strategy for Deloitte & Touche to desktop apps for Royal Caribbean. In 2012, Andy joined the Noble Studios team and helped lead the travel-and-tourism vertical working with iconic destinations such as Tahiti Tourisme, Yosemite, and Santa Monica. During his seven year tour, he was responsible for ensuring clients’ marketing goals were met and exceeded based on building creative digital experiences that produced measurable impacts. Certified in Google Analytics, Google Ads, and Optimizely, Andy’s expertise lies in taking a multi-pronged approach to moving audiences to action through effective digital marketing tactics and strategies that focus on brand engagement and user experience. On this front, he’s lent his expertise to an array of international brands—including Ford, Wikipedia, World Wildlife Fund, Paramount Pictures, University of California and more. A past president of the Reno-Tahoe American Marketing Association, Andy has partnered with his clients to earn more than 50 industry awards (we’re just hoping he has space on his desk for all of those trophies). The impressive list of accolades include multiple Communicator Awards, Web Awards, Daveys, W3s, ADDY awards, Adrian Awards, MarCom Awards, MobileWeb Awards, Summit Creative Awards, and AVA Digital Awards (whew). He has donated his time as both a volunteer for the Northern Nevada Children’s Cancer Foundation and as a speaker for Washoe County GATE (Gifted and Talented Education) programs. When he’s not in our offices, you can find Andy coaching his son’s t-ball team, exploring new cultures on an international trip with his wife and two children, or preparing for his next marathon (he’s already ran three full marathons, eight Reno-Tahoe Odysseys, and countless half marathons—and we’re exhausted just writing this).